The woven sunflower style that is pictured below can be woven for you in the size and colors of your choice. Tina always has some woven flowers available for immediate sale. 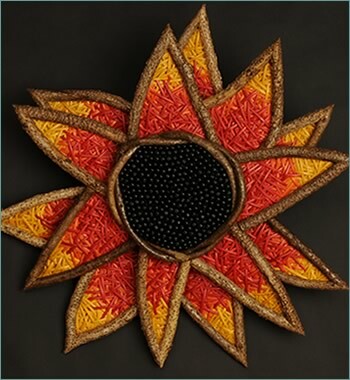 Please contact Tina directly to make a purchase or commission a custom-woven sunflower. H 36" W 36" D 5"
The center and petals of this brightly colored sunflower are framed from bittersweet vine. Then Tina has laid down multiple layers of reed in the colors of yellow, orange, and red using her own "Dimensional Weave" style to achieve the highly textured look of this attractive wall sculpture. The center is woven from both reed and beads. View an enlargement of the construction detail.